This aromatic and sumptuous classic Thai recipe can be made mild to red-hot, depending on your spice-o-meter. It starts with a homemade Thai red curry paste which is easily put together with your food processor or blender. Add coconut milk, chicken, and vegetables, and you have a heart-warming curry dish that will awaken your senses and boost your mood. This dish would traditionally have been simmered over a fire or stove-top, but we've adapted it to be cooked in the oven, allowing you to get on with your day. (Feel free to use the traditional method if you prefer, simmering the dish in a wok or pot on the stove, instructions for that are included below the recipe). Preheat oven to 350 F. Set chicken pieces in a fairly large casserole dish. Remove dish from oven. Add the bell pepper and tomato, stirring them into the sauce. Return curry to the oven for 15 to 20 minutes, or until both chicken and vegetables are well cooked. Do a taste test, looking for a balance of flavors. If not salty or flavorful enough, add up to 1 tablespoon more fish sauce. If too salty, add more fresh lime juice. If too sour, add a little more brown sugar. If too spicy, add more coconut milk. If not spicy enough, add a few fresh-cut chilies or dried crushed chili. Transfer curry into a large serving bowl. 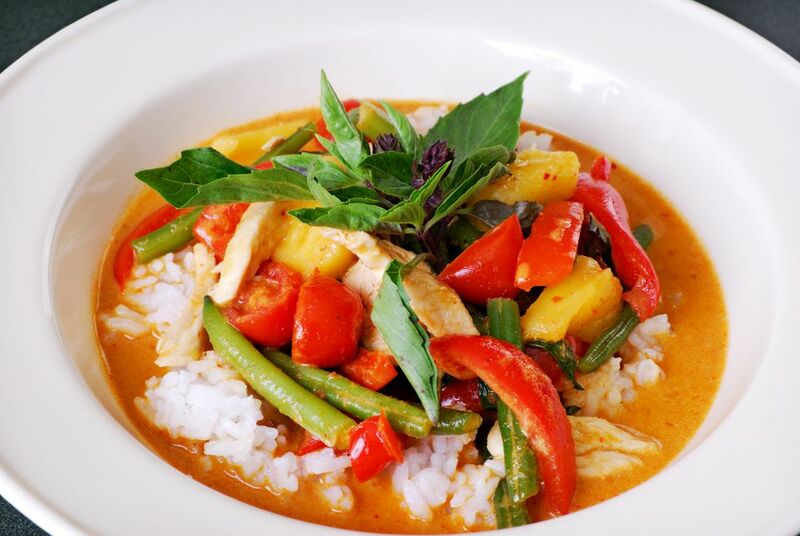 Sprinkle generously with chopped fresh basil and coriander, and serve with plenty of Thai jasmine rice. *Stovetop method: To cook this curry on your stovetop, simply combine sauce and chicken pieces (plus lime leaves and cinnamon) in a wok, deep frying pan, or large pot. Bring to a gentle boil. Reduce heat to medium-low, cover, and simmer 30 minutes, stirring occasionally. Add vegetables and continue simmering another 15 minutes, or until both vegetables and chicken are cooked. Follow recipe above for finishing the dish.